A sample may be defined as the number of items drawn from a lot, batch or population for inspection purpose. 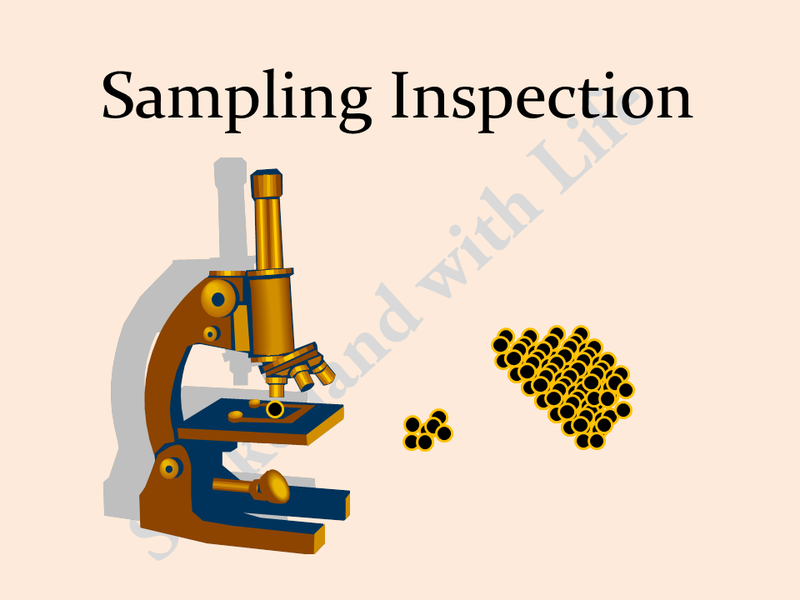 Sampling inspection can be defined as a technique to determine the acceptance or rejection of a lot or population on the basis of number of defective parts found in a random sample drawn from the lot. If the number of defective items doesn't exceed a predefined level, the lot is accepted, otherwise it is rejected. e.g. Purchasing wheat, rice or such other food grains we naturally take a handful of grains to judge its quality for taking purchasing decisions. Similarly in engineering sampling inspection is preferred because it is more practical, quick and economical as compared to 100% inspection. The cost and time required for sampling inspection is quite less as compared to 100% inspection. Problem of inspection fatigue which occurs in 100% inspection is eliminated. Smaller inspection staff is necessary. Less damage to products because only few items are subjected to handling during inspection. The problem of monotony and inspector error introduced by 100% inspection is minimized. The most important advantage of sampling inspection is that, it exerts more effective pressure on quality improvement. Since the rejection of entire lot on the basis of sampling brings much stronger pressure on quality improvement that the rejection of individual articles. Sample is not exact picture of lot, hence there will be chance of making wrong decisions. A really good lot(less proportion of defective than specified) may be rejected because of bad sample. In this case producer suffer the risk of reworking or in house failure of his product. A really bad lot (greater proportion of defective than specified) may be accepted because of good sample drawn. In this case consumer suffer the risk of accepting a bad lot and it is called consumer's risk. 2. Sample usually provides less information about the product than 100% inspection. 3. Some extra planning and documentation is necessary.